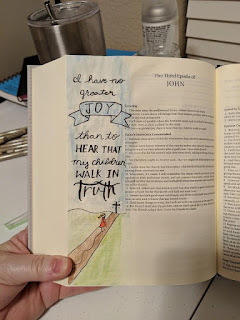 Journaling my heart and my faith. There have been many times in my life when I have felt broken down in spirit. My life has not always been easy or comfortable. But even in those times, I have always felt the Lord’s presence. He has carried me through too much for me not to put my trust in him. In 2003, I lost my son Daniel. He had Potter’s Syndrome and was stillborn. We found out that he had Potter’s when I was about 5 months along and we were given the choice to terminate or to carry to term. I chose to carry Daniel to term, knowing that his disease was incompatible with life outside of the womb. Those days and weeks leading up to his birth were hard because I could feel him moving inside me—he was so alive and safe in my womb. After his death, my heart felt like it would break. My sadness affected me much more deeply than I could have imagined. It was a sadness that went to the soul. While in this sort of sadness, it is hard to find joy. It is hard to even show joy on your countenance. My lack of joy caused me to lose my vitality for life—my broken spirit dried me out. During this time, I spent a lot of time in prayer and contemplation. 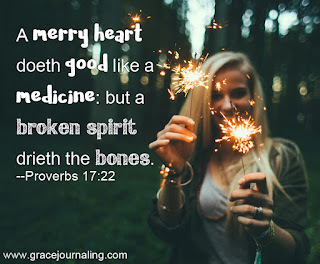 I prayed for the Lord to heal my hurt and bring me to a point where I could experience joy once again. One of the greatest helps for me was spending time with my other children. My boys have always been a merry lot. They smile, laugh, and goof off, so much so that you just can’t help but smile, laugh, and goof off with them. In many ways, their merry attitudes and smiles were a balm to my soul deep hurt. Time does heal all, especially when accompanied by prayer and lots of love. It took time, but through the prayers and love of my family and friends, I was once again able to find joy. 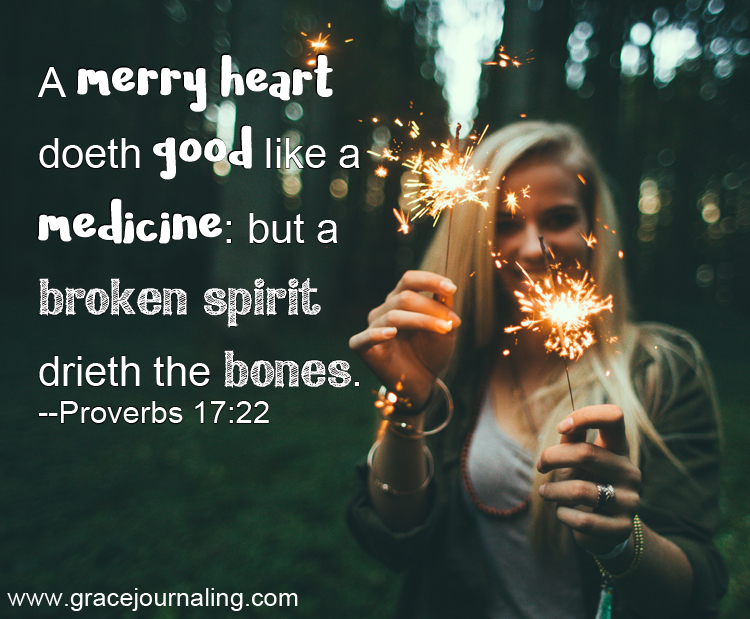 My merry heart returned and my broken spirit was repaired. Thank you so much for all the blessings you have given us. Thank you for healing our wounded hearts and making them whole again. Father, please be with those who are experiencing such deep sadness and whose spirits are broken. Help them to feel Your deep love for them. Help them to find the joy that they have lost. Heal them Father, and return to them a merry heart full of Your love. Hello! I'm Susan Lee Rose, the owner and author of Grace Journaling! I love journaling my heart and my faith through a variety of mediums. You will find my blog is just as eclectic as I am! Enjoy your stay!